If you have items to donate, contact us at feralcatcaregivers@yahoo.com to arrange a pick-up, or, it’s easy to donate cat care supplies directly to us! Just go to Amazon.com and search for our wish list titled “Campus Cats/Cat Zip Alliance”. Choose one or two items – like a bag of dry cat food and a toy – pay for them online, and your donation will be mailed right to us! fabric for making cat toys – cute patterns that cats will like! 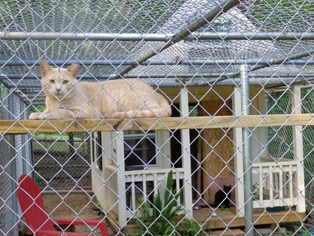 If you or someone you know is handy and would be interested in building, contact us for the plans/supplies to build badly needed wooden drop traps and raccoon-proof cat feeding stations. If you can purchase a trap or two for us, please visit: www.wildlifecontrolsupplies.com and search for the following product: Live Trap 36″ x 11″ x 12″H – Slide Release Rear Door $61.00 plus shipping (30″ size is okay too, $56.50, just be sure it has the slide release rear door). Direct link to trap.